A new garden critter! See how well he blends in. The start of tomato season wasn’t pretty. A juvenile groundhog skinny enough to squeeze through a standard chain link fence 6’ tall ravished my early plants. He (and it’s a he because I saw his balls dangling as he scurried through my fence!) ate the parsley, cucumber and zinnia plants down to the ground and “pruned” my tomato plants. I was hysterical. I’ve spent a lot of time protecting a very few garden plants and critters keep thwarting me. I added chicken wire around the bottom of the plants and all seemed well. I hoped the groundhog grew too big to shimmy through the fence. I planted two patio pots to see if I could forego all that “in-ground” work. That made the groundhogs and chipmunks happy. They didn’t have to worry about a fence at all. Easy pickings. Not doing that again although I did find a very sturdy cherry tomato plant that needs minimal staking and does not grow like Jack and the Beanstalk. My tomatoes were late. That’s party my fault but mostly the groundhogs. I put them in late but the pruning didn’t help. I’m a patient person (well, no I’m not but the for sake of this post let’s say I am). I was living the good life. Tomato acid was oozing out of my skin from my super high consumption. Bags of cherry tomatoes were forced on friends. Enough was picked every other day to support the Sixth Fleet. My cucumber plant is naked. There are no tasty leaves left, only 3 cucumbers which are now residing in my refrigerator. They didn’t touch the zinnias but they only like them when they are young and sweet. Sadly he ate all the lower slicing tomatoes. Red, green, didn’t matter. I hear he washed it down with a nice Merlot. Just sayin…. He didn’t touch my cherry tomatoes, most of the fruit are higher than 3’ and he can’t scale the plants. I’ll make due. Next year is another year to see who can outsmart who. Don’t bet on me winning. 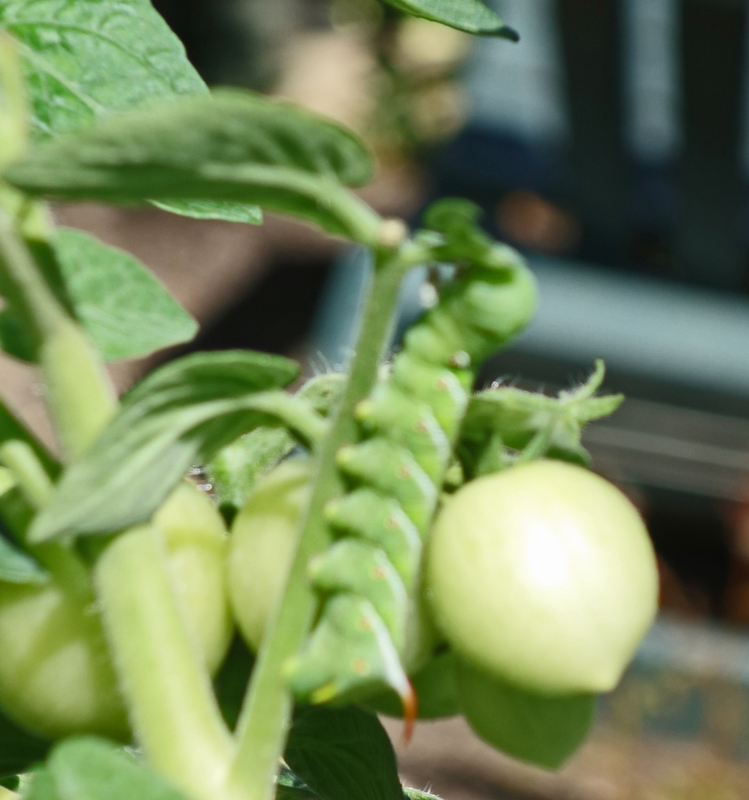 This entry was posted in Humor, Life at Home and tagged caterpillars, exasperation, fighting the critters for the garden, garden problems, gardening, Gardens, groundhogs, hope, tomato plants by Kate Crimmins. Bookmark the permalink. Can’t believe you had so much trouble with that groundhog. We would have been trapping and relocating him because we just know he would have dug under our porch to enjoy his meal and they stink. I made a bit of tomato sauce last night from our cherry tomatoes to throw over some spaghetti. It was surprisingly sweet… maybe that was the wine. We have a few green tomatoes left but I think we are at the end. We live about a quarter mile from a nature preserve (translation: that’s where people drop of their unwanted groundhogs). I love cherry tomatoes the best because they are sweeter. I cut them up and throw them on pasta with basil and call it a meal! Ok, maybe a dab of balsamic vinegar. Our slicers are at the end. We have some green but I don’t hold out a lot of hope for them. The cherries are still pumping away. New flowers every day. Bees buzzing. They are in full sun. Oh my Kate! You will be knee deep in groundhogs! People dump their unwanted kitties in our bit of country… thank heavens for our wonderful shelter. We are knee deep in groundhogs and squirrels and this year bunnies although we also have a lot of hawks and foxes to keep populations in check. Hmm…sounds like something I said last year! Really I shouldn’t complain too much because I did get enough tomatoes. It’s always a mud wrestle for who gets the first ones (that would be between me and the critters). Basil peters out in the heat even when you keep the flowers clipped off. I have given up on vegetable gardening. Heat, bugs, varmints, I can’t deal with it. I grow some flowers, but I let the farmers grow the food and I go to the farmer’s market. Wise woman. I love to torment myself with the annual competition for the tomatoes! We have about given up on tomatoes with opossums and then this year a Mockingbird got our tomatoes. A caterpillar got my parsley and jalapano peppers. Basil faded out quickly in the heat. You are much more ambitious with your gardening. We are down to pots only but I plan to replace a few herbs when it gets cooler here…probably by November! At least your cherry tomatoes did well! Cheers for trying, Kate! My basil is done too. Had to buy it at the market! At the end of each summer I talk about taking down the fencing and converting back to grass. Maybe next year. The fun is in trying to outsmart hungry critters. You almost had them bamboozled Kate. We finally surrlendered. But Bill had his revenge when the fence and vegetable beds came down and the area was restored to grass. Herman’s farm market is now our source for summer bounty. One day I will do that too. We have some farm markets here but it’s the tomatoes. They all refrigerate them and they lose so much flavor. I gave up most other things, mostly because it was too much work! I refuse to trap and relocate them. Others would move in to replace. Each year we do this dance. Maybe you should consider the groundhog one of your pets, like your cats and your fish. Too bad we can’t write off their food on our taxes. It has a name but I can’t put it here. I am notoriously not a gardener, but my sense is that your garden is the only good pickings around. We have no fences, no protections against varmints, and yet there is a sort of harvest, such as it is, throughout the summer. I assume our pathetic little garden is the last resort for local groundhogs and such who have become accustomed to something better in the near vicinity. The upshot of all this – maybe you should set your sights lower! Or get your neighbors to garden too! We have one neighbor with 2 tomato plants and that’s it. In my neighborhood people hire people to do things. No gardeners around except for me so no matter what I plant it’s exquisite and tasty and unusual from the foraging they do in the woods. My expectations of my peach trees are a half dozen. That’s out of about 200 on the trees. Got nada this year. I’m just a little pissy about that. I sympathize with your eternal battle of the critters. That’s probably why I was never tempted to grow plants for which I had culinary expectations. I take that back. Last year I was lured into buying two tomato plants for the deck. I’m quite sure the produce we got cost no more than $10 per tomato. I stand in awe of all people who attempt to become mini-farmers. Amortized over the years, the fencing, timbers, deer deterrent sprays and therapy sessions for me upped the tomato price to close to $30 a pound. I WILL NOT GO DOWN IN DEFEAT! We didn’t grow tomatoes this summer because we were traveling but last year we had a… probably bird… peck each tomato once, thus ruining each one. I put a bird netting around the plants after that but I needed to be careful that the little lizards couldn’t get caught in it. I probably would have squished the voracious worm… and not felt bad one little bit. I had a chipmunk get caught in the netting and die many years back so I’m very careful with it. I tried the netting on the lower peaches on my tree. Didn’t work. They figured out how to undo it and munch. We had a TON of those green caterpillars. I put them in the ivy and possibly in the yard of a neighbor I don’t like. Despite the incursion, Andy’s made a dozen jars of tomato sauce and we were living high on the hog with the purple Cherokee tomatoes and fresh mozzarella. I did all right too but I had 5 plants in the ground and 2 in pots. That’s for 2 people and various friends that force tomatoes on! Segregation never works. That’s something humans don’t get. And yes I’d prefer to see critters each tomatoes in National Geo instead of my yard! But that wasn’t MY tomatoes. It’s amazing how voracious those caterpillars can be . . . and how they appear from thin air before they fatten themselves up on the fruits of our labor. Sorry he found your garden and decided to decimate it. Glad you have some cherry tomatoes left. I don’t know where he came from. I didn’t find another one. You would think something laid a batch of eggs. I was so fascinated with how well he blended into the plant. The exact same shade of green. You will never win the war! Best you can hope for it a shared arrangement – at least in our experience. Yes, I just want the bigger share. Oh yes, and the first ones! After oiur success in the cottage veg plot, we were gutted to only have FOUR tomatoes on our plant here on the boat. In fact, those and a dozen green beans were our only fruit. Next year, we are going to try potatoes and revert back to our original tomato strain rather than something ‘small’ suitable for patios! My “patio” tomato did not yield much. Partly it may have been because of the sun. As the summer moves the sun more south, the place where I put it got shadier. The garden gets full sun all day and does much better. I did potatoes for many years. Very easy even when the beetles voraciously devoured the leaves, I had many potatoes underground. We shall certainly be trying them in one of our buckets next year Kate! I just might take you up on that. Start planning for next year. Just a little summer vacation. Of course! Just like my own cats. They also have a screened porch so they can enjoy cool breezes at night without getting into (too much) trouble. You will be just like Bashful. Oh…wait…do you fit in a mailing box? Well, at least all of the critters were well fed. Overfed is a better word and on the equivalent of filet! I can share. I like first pick! We have 2 peach trees which get 200 peaches every year. Yet I am lucky if I get a half dozen. This year I got nothing. The deer eat from the bottom and the groundhogs climb and eat the upper ones. (Yes, I saw it with my own eyes!) They eat them when they are green. The trees are work so they are getting cut down this fall. The critters need to learn to share. But they do share. They share themselves with you as they present you with images of nature that you would otherwise probably not see and, keeping in mind that you are probably living on what was historically “their turf”, that is quite generous of them. Bravo nature! So tomato caterpillars turn into beautiful butterflies? Somehow I doubt that although I didn’t squash it and gave it an extra tomato leaf to munch on.